Right: This left-aligned list format is acceptable, but the bulleted items don’t stand out as much as they could. Left: Clarity and emphasis are increased by indenting the text (using InDesign’s Indent To Here feature) and adding space between the list items. Set in ITC American Typewriter. Bulleted lists are a great way to draw attention to a sequence of items, facts, or logical arguments. Most word processing and page layout applications will automatically format these lists for you. However, for the best results you’ll want to learn how to take typographical control of this useful way of communicating information. Your readers will be glad you did! Automated bullet list functions don’t allow you to ?nesse all the elements necessary to create a typographically tasteful and effective treatment. But if you decide to create your lists manually, what are your options? For an in-depth look at bullets themselves, check out FYTI Bullets. As for the rest, it’s all about alignment and spacing. When all of the items in a bulleted list are single lines of text, the question of how to vertically align the text doesn’t come up. But what if some items are two or more lines? In that case, you can either align second and subsequent lines of text with the bullet above, or align them with the ?rst line of text. 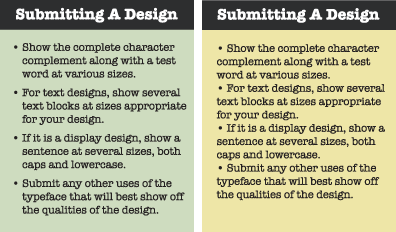 Either option is acceptable, but the second method looks cleaner and creates greater emphasis. As for the horizontal position of the bulleted list, the cleanest and most attractive choice is to align the bullets with the left margin of the copy above the list. You’ll occasionally see a treatment where bullets are pulled into the margin, with the content of the list left-aligned to the copy above, but this style decreases emphasis (which is the whole point of the list to begin with!) and disturbs the integrity of the margin. In most cases, one word space is the right amount of separation between the bullet and the text. Beware the large spaces created by automatic bullet list functions! If you feel your list needs a bit more breathing room, resist the temptation to hit the space bar twice (two word spaces are usually too much). Instead, use the Tab to control the amount of space after each bullet. "The Indent To Here" feature described above will work with a tabbed space as well as those created with the space bar. As for extra space between the list items, none is needed if the items consist of single lines. When the list items themselves are blocks of copy, consider adding some space between them for extra emphasis, more clarity, and better readability.